The students of all primary and high schools started the year with new textbooks. 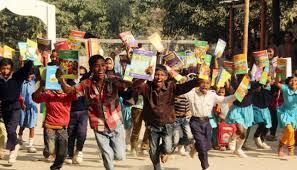 New textbooks were distributed yesterday to the students of almost all primary, high schools and Madrashas. The 1st day of the year was celebrated as the ‘Textbook festival day’ .The Prime Minister Sheik Hasina inaugurated the programme by distributing books to some students in the town hall on Thursday. But the main festival was celebrated across the country yesterday. The festival was organized centrally by the Ministry of Education in Govt. Laboratory High School. Education Minister Nurul Islam Nahid inaugurated the festival by distributing book to a visually impaired student. “when this (free book distribution) programme started in 2010 ,the number of students was 2.5 crore and now it’s almost double” he said in his speech. “The students of our country aren’t intellectually poor. They are capable of conquering the world.” He added. Around 33 crore 37 lakh 16 thousand 772 books will be distributed this year among the students of primary ,high , Ebtedayi , Dhakil and other institutions .